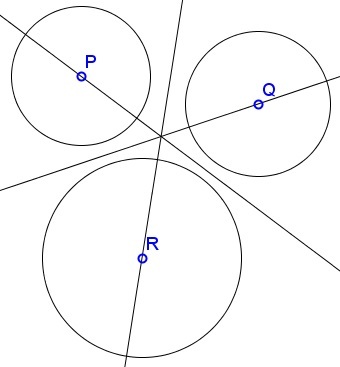 Let there be three circles (P), (Q), (R) centered at P, Q, and R, respectively. Assume that P lies on the radical axes of (Q) and (R); Q, on that of (P) and (R). Then R lies on the radical axis of (P) and (Q). The radical axis of two circles is perpendicular to their centerline. Let's denote the radical axes of circles centered at points U and V as LUV. If, as stipulated in the problem, P lies LQR and Q lies on LPR, then the two lines serve as altitudes (from P and Q) of ΔPQR. Their intersection - the radical center O of (P), (Q), (R) - doubles as the orthocenter of the triangle. The third altitude (from R) is perpendicular to PQ and passes through the radical center O, but there is only one perpendicular to PQ through O and this is the radical axis LPQ. It follows that R ∈ LPQ. Note: this problem generalizes another one where the three circle have been assume to be concurrent. The proof is only a slight modification of one of the proofs of the latter.